This page gives a brief introduction to Crowd, for people who will view and update their login and user profile information in Crowd. Atlassian's Crowd is a software application installed by the system administrator. The administrator will also connect one or more of your organization's applications to Crowd. When you log in to a Crowd-connected application, Crowd will verify your password and login permissions. 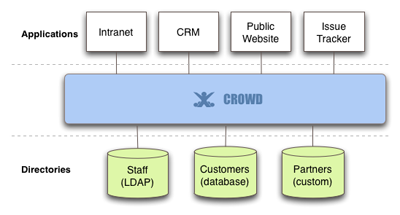 Using Crowd for single sign-on (SSO), each person needs only one username and password to access all web applications. You can host your own OpenID provider to include external applications. You only need to log in once, to Crowd or a Crowd-connected application. When you start another Crowd-connected application, you will be logged in automatically. When you log out of Crowd or one of the Crowd-connected applications, you will be logged out of Crowd and the other application(s) at the same time. Your login permissions to various applications. The password you use to log in to those applications. The groups and roles you belong to, which are used by the applications to decide which functions you can perform within the applications. The user directories which hold your information. The Crowd administrator has access to Crowd's Administration Console, which provides the functions described in the Administration Guide. Every authorized Crowd user has access to Crowd's Self-Service Console, where you can edit your user profile, change your password and view other information about your Crowd username. The User Guide describes this functionality. Here is a list of all entries in the glossary, plus the first few lines of content. Click a link to see the full text for each entry. A Crowd administrator is a user who has access to the Crowd Administration Console, which provides the functions described in the Administration Guide. The first administrator is defined during the installation of Crowd. A Crowd administrator can grant administration rights to other users, as described in the Crowd Administration Guide. A 'Crowd-connected application' is a software application which has been designed and configured to use Crowd for user logins. These applications pass all login requests to Crowd for authentication. Depending on the integration level, the application may also make use of the groups and roles defined in Crowd for authorization purposes, and allow single sign-on across the Crowd domain. The Crowd Administration Guide tells you how to connect an application to Crowd. Crowd uses the term 'directory', or 'user directory', to refer to a store of information about a user. Typically, a directory will hold your username, name, password, email address, and so on. Your Crowd administrator can define one or more directories internally in Crowd or connect one or more external directories to Crowd. Support for roles, previously deprecated, was removed in Crowd 2.5. Authorized Crowd users can access the Crowd Console, even if they are not Crowd administrators. Non-administrators will see a subset of the Crowd Console functionality, which we call the 'Self-Service Console'. The User Guide describes this functionality. The Crowd Administration Console presents the full range of Crowd administration functionality to authorized Crowd administrators. Single sign-on (SSO) is a feature offered by Crowd. Your Crowd administrator can choose to enable this feature for the Crowd-connected applications. If SSO is enabled, you will only need to log in or log out once.